For other uses, see Running back (disambiguation). A running back (RB) is an American and Canadian football position, a member of the offensive backfield. 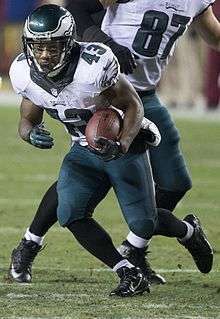 The primary roles of a running back are to receive handoffs from the quarterback for a rushing play, to catch passes from out of the backfield, and to block. There are usually one or two running backs on the field for a given play, depending on the offensive formation. A running back may be a halfback (in certain contexts also referred to as a tailback) or a fullback. A running back will sometimes be called a "feature back" if he is the team's starting running back. When not serving either of these functions, the primary responsibility of a halfback is to aid the offensive linemen in blocking, either to protect the quarterback or another player carrying the football. As a trick play, running backs are occasionally used to pass the ball on a halfback option play or halfback pass. While in years past the fullback lined up on the field for almost every offensive play, teams often opt to replace the fullback with an additional wide receiver or a tight end in modern football. Fullbacks in the National Football League rarely carry or catch the ball since they are used almost exclusively as blockers. Fullbacks are also still used occasionally as rushers on plays when a short gain is needed for a first-down or touchdown. Pro Football Hall of Fame members Jim Brown, Marion Motley, Franco Harris, John Riggins, and Larry Csonka were fullbacks. At the other extreme are "power backs:" bigger, stronger players who can break through tackles using brute strength and raw power. They are usually slower runners compared to other backs, and typically run straight ahead (or "North-and-South" in football terminology) rather than dodging to the outside edges of the playing field. Hall of Famers Earl Campbell, Bronko Nagurski, John Riggins, and Larry Csonka were considered power running backs. Running backs are also required to help the offensive line in passing situations, and, in the case of the full back, running plays. Running backs will often block blitzing linebackers or safeties on passing plays when the offensive line is occupied with the defensive linemen. On running plays, the fullback will often attempt to tear a hole in the offensive line for the running back to run through. Effective blocking backs are usually key components for a running back's success. On passing plays, a running back will stay back to help block and pick up the blitz. Running backs are sometimes called upon to return punts and kickoffs, a role usually filled by wide receivers and defensive backs, such as cornerbacks, who are generally the fastest players on the team. 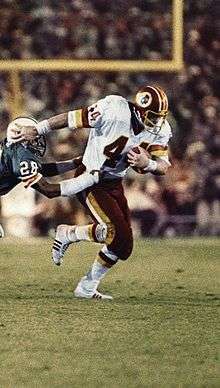 A running back, Brian Mitchell, currently holds the NFL records for career kickoff return yards (14,014 yards) and career punt return yards (4,999). ↑ "Top 10 most elusive runners in NFL history". NFL.com. National Football League. May 28, 2008. Retrieved October 14, 2016. ↑ Burke, Chris (March 5, 2013). "Top 25 Power Running Backs Of All Time". Sports Illustrated. Retrieved October 14, 2016. ↑ "Lenny Moore Bio". profootballhof.com. Pro Football Hall of Fame. Retrieved October 14, 2016.